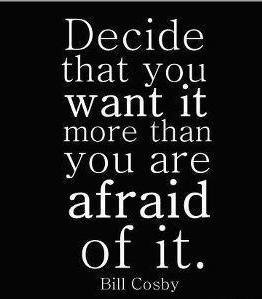 You can't let fear stop you from getting what you want in life. You have to decide you want something and do everything in your power to get it, even if it means stepping out of your comfort zone. We all are faced with tasks that seem overwhelming and daunting. But, if we put forth the effort and have the mindset that we can do it, then we can. What we accomplish in our lives depends greatly upon our attitude. Have the right mindset and a strong attitude and you can accomplish anything. Even the hard things in life become easy.